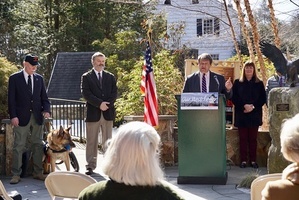 On “National K-9 Veterans Day,” Westchester County Executive George Latimer announced that more than $30,000 has been raised by Friends of Lasdon Park & Arboretum, to erect a memorial statue dedicated to hero dogs in the military. The statue, a life-sized sculpture based on a World War II War Dog named “Chips,” is planned for the Trail of Honor at Lasdon Park. The sculpture will pay tribute to the thousands of service dogs who have fought to protect our nation’s soldiers in violent war zones. Nero, an impressive German Shepard who served in Iraq, was present for the announcement along with his owner John Conley, a Vietnam and Afghanistan War Veteran. The money for the statue has been raised by Friends of Lasdon Park & Arboretum to honor the family of Edward J. Wren of Pleasantville, who brought Chips home after the war. Chips was a German Shepherd-Collie-Siberian Husky mix who trained for the United States Army, and is reputedly the most decorated war dog from World War II. Military service dogs are tasked with detecting bombs, drugs and weaponry, and bring life-saving capability to fight against terrorism. The statue is being created by artist Lena Toritch, MFA, a sculptor whose stunning pieces have been placed throughout the country for military and police personnel. An unveiling date of June 22, 2019 is planned at Lasdon Park.